Directions (Q. 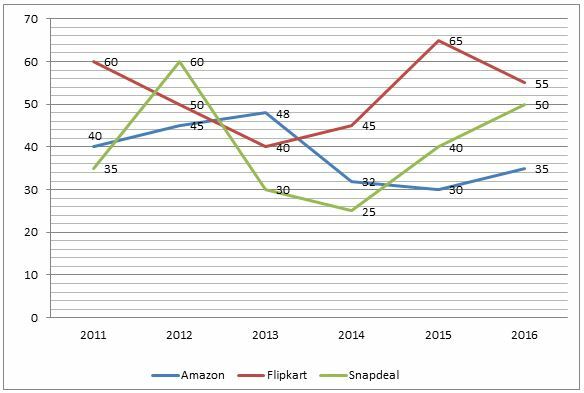 1-5): Following line-graph shows the percentage profit earned by three e commerce companies Amazon, Flipkart and Snapdeal in the period of 2011 to 2016. 1. If the expenditure of Flipkart in the year 2011 and the income of Snapdeal in the year 2014 are equal then what is the ratio of the income of Flipkart in the year 2011 to the expenditure of Snapdeal in the year 2014? 2. What is the percentage rise in the percentage profit of Flipkart from 2013 to 2014? 3. If the total expenditure of Amazon in the year 2011 and Snapdeal in the year 2015 together is 94 lakh then what is the sum of the total income of Amazon in 2011 and Snapdeal in 2015? 4. If the expenditure of Amazon in the year 2013 is 55.5 lakh then what is its income in that year? 5. If the income of Amazon in year 2011 and expenditure of Flipkart in year 2012 are equal and 91 lakh each then what is the difference between the income of Flipkart in 2012 and the expenditure of Amazon in the year 2011? 6. The total number of PO candidates attending exam in Jaipur forms approximately what per cent of the total number of PO candidates attending exams in all the cities? 7. What is the total number of SO candidates attending exam in Chennai? 8. What is the ratio of total number of Clerk candidates attending exam in Mumbai to the total number Clerk candidates attending exam in Jaipur? 9. What is the approximate average number of PO candidates attending exam in all the cities?